Six Shooter is a brand new release from Nextgen Gaming which is difficult to compare to anything that has gone before; it’s a game designed purely from scratch for online play and it’s not something you will find in bricks and mortar casinos. It’s a dice-based game which is simple to pick up and play so read on to find out more. Six Shooter is a good-looking and well-designed game and it all takes place on one screen. The action happens on something like a craps table and it pits the player against the croupier in a dice game. 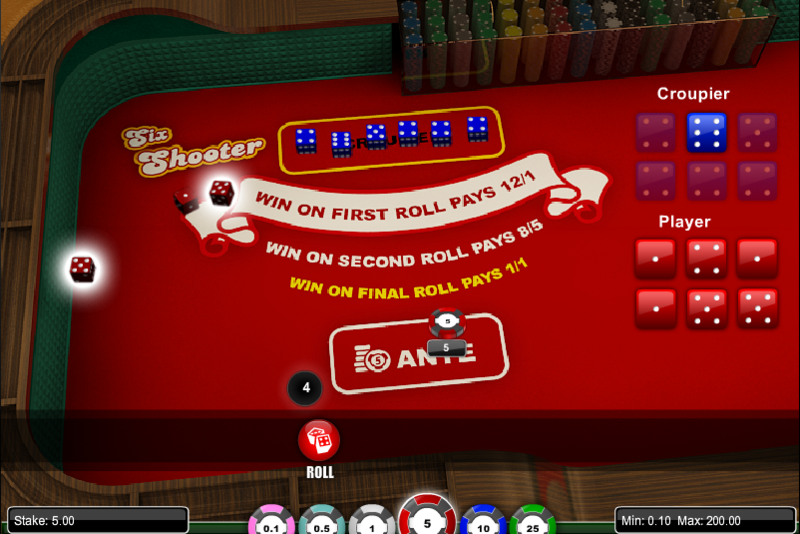 The aim of Six Shooter is to match the six dice the croupier throws with nine of your own and the faster you accomplish this, the greater the return. The first thing to do is select your bet level from the chip selection at the bottom of the screen – click on the ‘Ante’ space to place that bet which can be £0.10 – £200.00. If you fail to match all the numbers within nine dice then the croupier wins. That’s all there is to it so now you can take your win or accept your loss and try again. Use the ‘New Bet’, ‘Rebet’ or ‘Rebet x 2’ options to get things underway. We like a high quality dice game and it’s far simpler than trying to get to grips with Craps for example. In fact it may well be too simple for some but it’s fun nonetheless. Unfortunately we do not know the RTP of Six Shooter.